You want to define the month or the day for a specifi c date automatically in a work sheet. Use the Excel function “TEXT()”. It converts numeric values into text outputs. Excel internally saves a date as a numeric value. You can infl uence the text output using the formatting sign and can for instance determine the week day for a particular date. The function has two parameters: the numeric value to be converted and the formatting sign with inverted commas on both sides. The formatting sign “tttt” coverts the specifi ed date into a week day. If you only require an abbreviation of the week day, you can use the “ttt” format, for instance. The time can be displayed in the 12-hour format with an identifi er for mornings (am) and afternoons (pm). For this, add the desired identifi er “AM/PM”, “am/ pm”, “A/P” or “a/p” after the time format, separated by a space. These different formatting signs can also be combined. If, for instance, you want to display the exact time without the seconds, you can use =TEXT(A1,“hh:mm”). 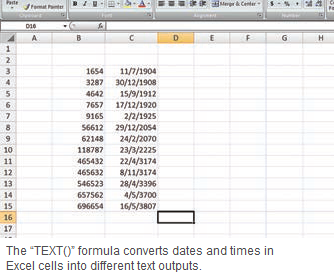 If the time is in the 24-hour format, and Excel needs to display it in a 12-hour format, then you can use =TEXT(A1, "hh. mm am/pm"). 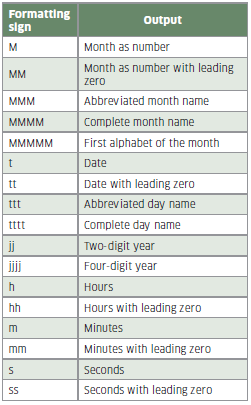 The table (above) lists the possible formatting signs and their functions for date and time output. Pay attention to the upper and lower cases here. Use add-ons in Opera as well – finally!